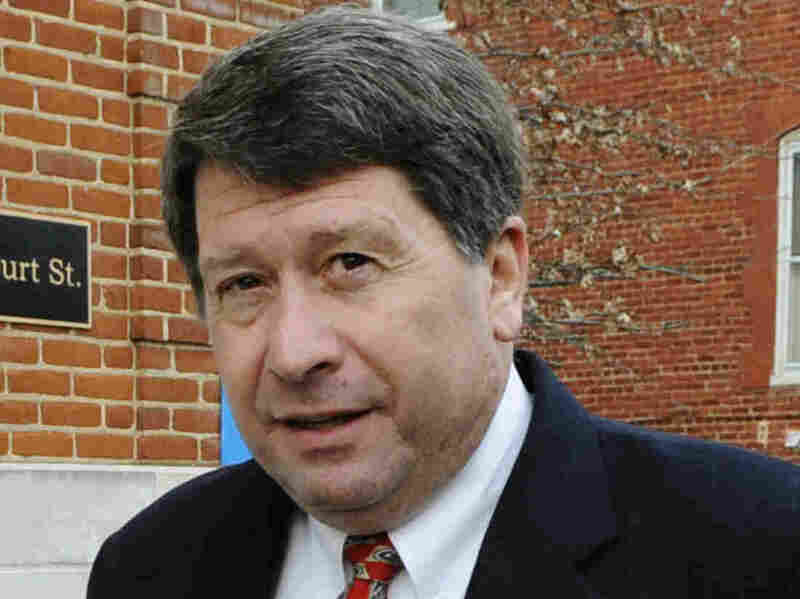 Peanut Exec Gets 28 Years In Prison For Deadly Salmonella Outbreak : The Salt Former Peanut Corporation of America CEO Stewart Parnell's sentence is by far the harshest U.S. authorities have handed down in such cases. Emails revealed he and others knowingly sold tainted food. Peanut Corporation of America's then-president Stewart Parnell arrives at federal court in 2009. Parnell was sentenced Monday to 28 years in prison for his role in a deadly salmonella outbreak from tainted peanut butter products. A former corporate CEO has been sentenced to 28 years in prison for selling food that made people sick. Two other executives face jail time as well. These jail terms are by far the harshest sentences the U.S. authorities have handed down in connection with an outbreak of foodborne illness. The outbreak, in this case, happened seven years ago. More than 700 cases of salmonella poisoning were linked to contaminated peanut products. Nine people died. Investigators traced the contaminated food to a factory in Georgia operated by the Peanut Corporation of America. The outbreak, by itself, was not unprecedented. There have been bigger, and deadlier, outbreaks of foodborne illness. But the emails that investigators found at the Peanut Corporation of America set this case apart. Some of the emails came from the company's CEO, Stewart Parnell. "Stewart Parnell absolutely knew that they were shipping salmonella-tainted peanut butter. They knew it, and they covered it up," says Bill Marler, a food safety lawyer who represented some of the victims. Before and during the outbreak, company executives assured customers that their products were free of salmonella when no tests had been carried out. When tests did turn up salmonella, company executives sometimes just retested that batch, and when it came up clean, they sold it. In one memorable email exchange, when Parnell was told that a shipment was delayed because results of salmonella tests weren't yet available, he wrote back, "Just ship it." Last year, Parnell and two other people involved in PCA's peanut business were convicted of criminal charges that included fraud, obstruction of justice and selling adulterated food. These were almost unprecedented charges in the food industry, and Marler says that executives in other companies are paying close attention. "The arrest of Stewart Parnell, his conviction on these felony counts and his sentence have put a very big chill in the boardrooms of corporate America," he says. The Peanut Corporation of America is no longer in business. At the sentencing hearing for Parnell and his colleagues, relatives of some of the victims confronted Parnell with stories of their suffering. Parnell, for his part, asked for forgiveness and mercy, and said that he never intended to harm anyone. His daughter said that he sometimes brought his company's peanut butter home for his family to eat. Parnell's 28-year sentence wasn't the only penalty. His brother Michael Parnell was sentenced to 20 years in prison, and another former executive was sentenced to five years. All of these sentences are the harshest ever imposed in connection with an outbreak of foodborne illness. In some other recent cases, companies sold contaminated eggs and cantaloupes that also were linked to multiple deaths. Executives in those companies were sentenced to probation and a few months in prison. Stewart Parnell's lawyers have indicated they will file an appeal.